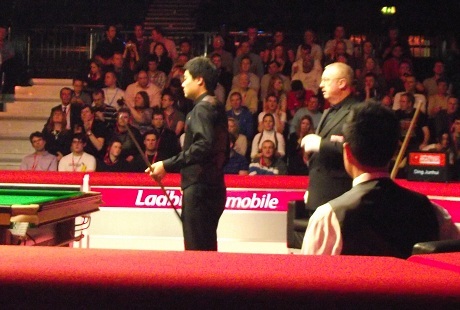 Its the last day and the final of the Ladbrokes Mobile Masters 2011 and I was in attendance once again. 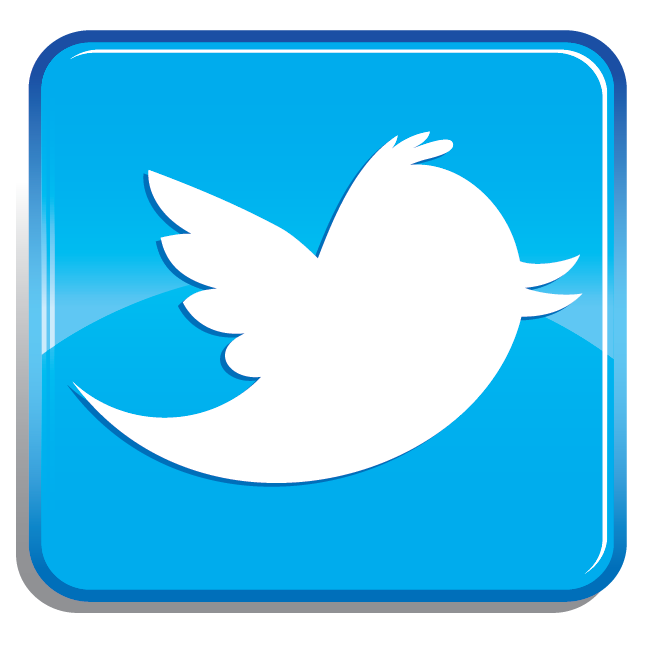 The two players to make it through to the final were China's Ding Junhui and Hong Kong's Marco Fu who had both been playing spectacular this week. It was the first time two players from Asia had reached the final of a major World Snooker event, so there was bound to be tens, if not hundreds of millions of people watching in China which must of added more pressure to these boys. I was informed a few days back that my fourth row seat for the final had been changed due to unforeseen circumstances but when I arrived it turned out I got a front row seat ticket instead, right behind Marco Fu so that was a nice bonus. Rob Walker did his catchphrase "Let's get the boys, on the baize! 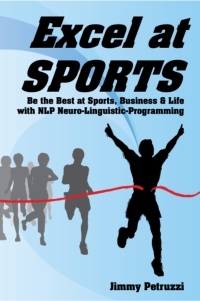 ", the players entered and Ding broke off to start frame one. 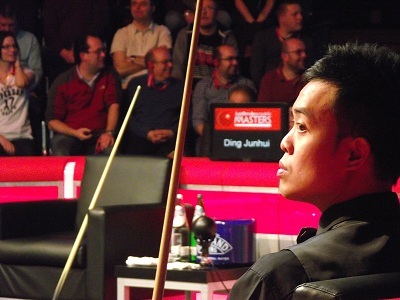 Ding stamped his authority on the match from the first frame, with a fantastic clearance of a 120, and he never looked back from there, keeping the lead throughout the match. The second frame started in a similar fashion to the first with Ding potting a brilliant long red and making another sublime break of 74 to go 74 up. Marco had not yet potted a ball. Fu finally got a look-in in the third, with a lovely 80 break to come back to 2-1 down, but Ding owned the last frame before the mid-session interval with a break of 61 to go 3-1 up. Fu could of taken the next frame when they returned but missed the last brown which allowed Ding to make a lovely clearance. 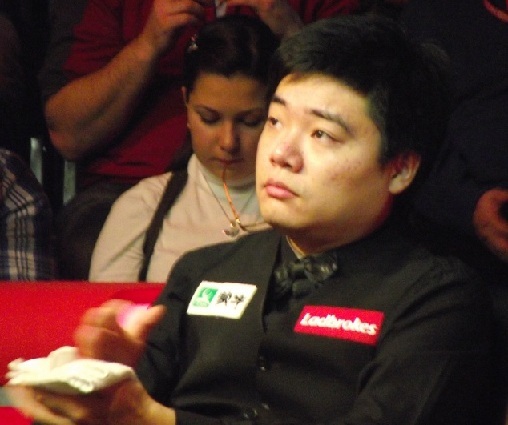 Fu came back into the next one to win the frame with a break of 82 thanks to an unbelievable fluked blue to come to 5-2. But it was all Ding again in the next and a neat break of 66 was enough to take an imposing 6-2 lead going into the evening. After a brief refuel at the local fast food place I went back to Wembley arena for the evening's session and there wasn't much to do until the doors opened again for us to take our seats. I do miss the Cuezone table they had last year and at the UK Championship's, was nice to get a hand on the tables that the professionals themselves use and watching other people try different challenges on them is a great way of passing the time. Did spot World no.21 Martin Gould waiting in the lobby though, he only lives a few miles away so it would be great to see him in this event next year, he certainly can play with the best of them. Back into the arena and Hazel Irvine introduces the players and they walk down the long stairs into the playing field to a great reception from the fans. Fu stormed right back into the match taking the first two frames with breaks of 59 and 69 to go only 6-4 behind, could he make a comeback? 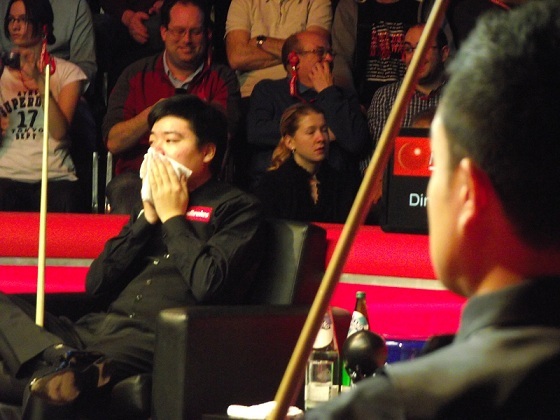 The next frame was the turning point though, it looked like Marco was going to win it, but a careless shot on the final pink gave Ding the chance to play the snooker that he needed and he managed to get it. Marco misjudged the angle and the white went straight into the pocket, gifting Ding the frame which should of been Marco's. After this happened Marco looked demoralized and would not win any more of the frames that evening. 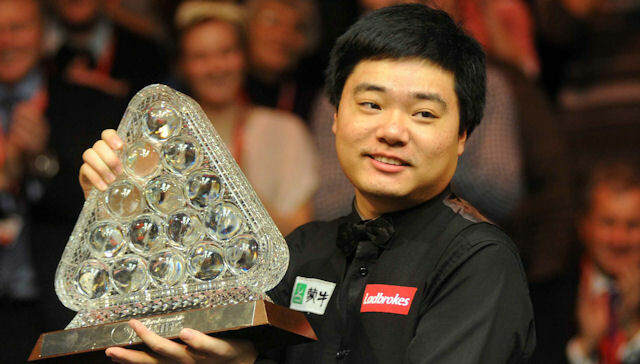 Ding took the next four in a row with runs of 94, 83 and 85 to take his inaugural Masters title and the cheque for £150,000. He played brilliantly and consistently all night, his best quality had to to be his consistent long potting though. Fu was good in amongst the balls but missed so many long pots and left reds on, off the break off shot. That was the crucial difference between the two players. Ding will be delighted with how his season has gone so far. Winning PTC5 in Sheffield earlier on and now to take the Masters title shows that he is not just a flash in the pan, he is here to stay amongst the top players for at least the next ten years, possibly longer. Marco will be disappointed not to have won the final, but he can be proud that he played some brilliant Snooker this week and also that he was the lowest ranked competitor out of all the players at the Masters and isn't even in the top 16 at the time of writing! He will be looking for a couple wins in the German Masters and the Welsh Open to secure his place back in the top 16 in time for the World Championship cut-off point.